The American Chemical Society (ACS) has named Jin Zhang, professor of chemistry and biochemistry at UC Santa Cruz, to the 2011 class of ACS Fellows. ACS Fellows are selected "for outstanding achievements in and contributions to science, the profession, and the society." With more than 163,000 members, the American Chemical Society is the world's largest scientific society and a leading source of authoritative scientific information. Zhang and the other 2011 ACS Fellows will be honored at a special ceremony during the ACS national meeting in Denver in August. Zhang is known for his contributions to nanoscience and nanotechnology, a field that involves manipulating the properties of materials on the scale of atoms and molecules. His lab has developed new strategies and nanocomposite structures for photoelectrochemical applications to generate hydrogen from the splitting of water molecules. His research has demonstrated the feasibility and importance of engineering the electronic band structures of new nanocomposite materials for technological applications including solar energy conversion. Zhang is also a pioneer in the application of ultrafast laser spectroscopy to the investigation of nanomaterials, including semiconductor and metal nanostructures. A third area in which he has made significant contributions recently is the use of novel metal nanostructures for cancer therapy and as sensors for chemical and biochemical detection and analysis. Zhang has served as a senior editor for the Journal of Physical Chemistry since 1994 and has organized and co-chaired numerous symposia at local and national ACS meetings. A fellow of the American Physical Society and the American Association for the Advancement of Science (AAAS), Zhang earned his B.Sc. at Fudan University, Shanghai, and his Ph.D. at the University of Washington in 1989. 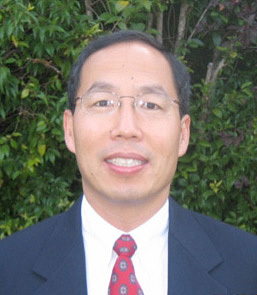 He joined the UCSC faculty in 1992.